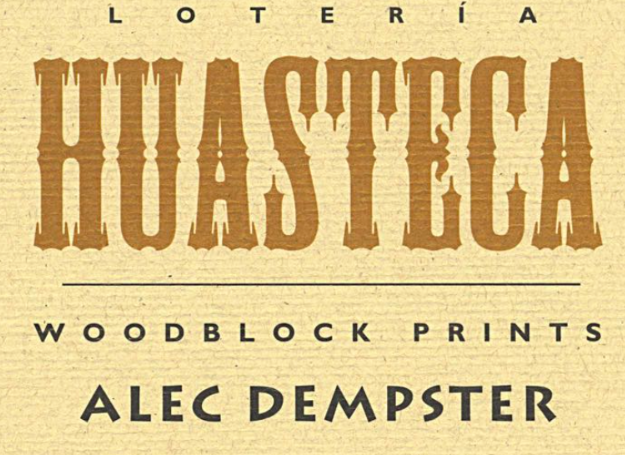 Out of the blue, Alec Dempster wrote to tell me about his new book, Lotería Huasteca. I know a good deal about Mexico, but never heard of the Huasteca. This book is both charming and illuminating. 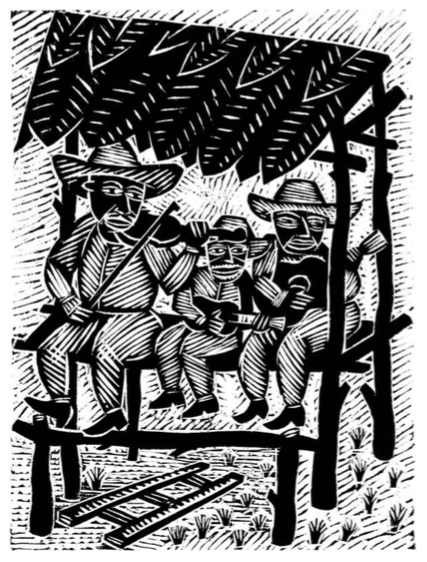 Its woodblock prints provide 54 little windows into the Huasteca culture of East-Central Mexico. Oddly enough, last week we had a master woodblock printer from Mexico on Kutztown’s campus, Alan Altamirano. He often advised our students “dibujar sin meido” to “draw without fear.” Alec Dempster draws without fear. 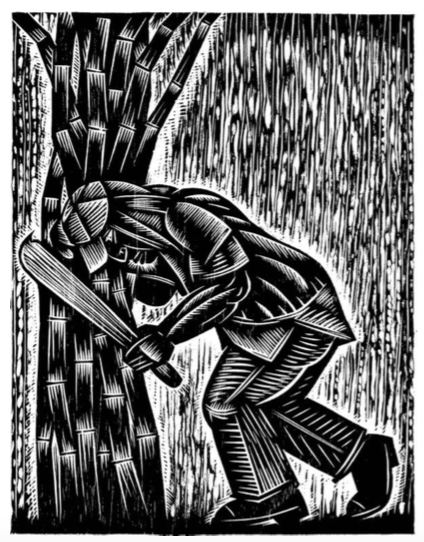 His gutsy woodcuts are infused with a profound respect for Mexican culture. I have traveled some of the same highways as Dempster in the mountains of Vera Cruz, but Dempster has seen much more than I. It helps that he is an accomplished musician, and although he is Canadian, he was born in Mexico. It was an invitation to a musical event that launched his Huasteca project. 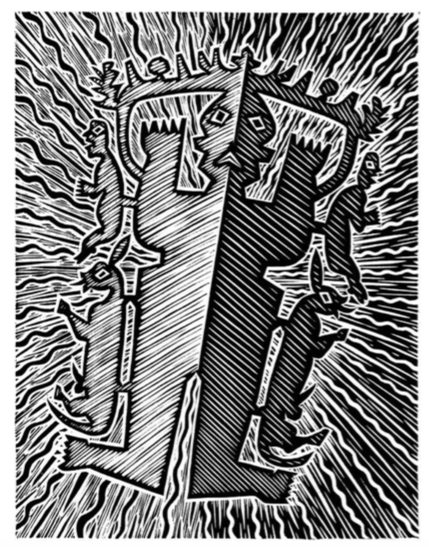 The prints are boldly cut in the tradition of early Taller Grafica Popular prints or the drawings of Jean Charlot. The text is accessible and informative. The prints are presented in alphabetical order. At one level this alphabetical construct seems odd, but Dempster gives a good introduction. He fashions his presentation after Mexican lotería cards, a deck used for a game something like BINGO. He manages to place the Huasteca creation myth near the beginning with the Arbol Florido pictured above. I love the image of the birds and beasts suckling at the tree’s many breasts. 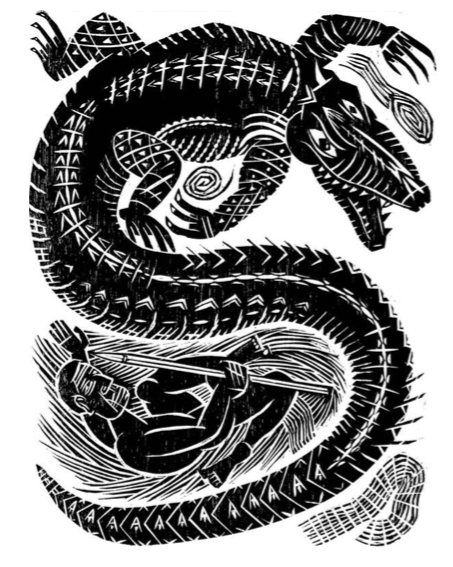 Alec Dempster’s Amate illustration seems to pulsate off the page. ‘A’ is also for amate. Anyone who visits Mexico will be approached by vendors selling naive prints done on cork-colored amate paper. Dempster chooses to portray a lesser-known use for the ancient paper. Dempster manages to convey much of the power and glory of Mexico. Every one of the images is flanked with a thoughtful descriptive essay, and Dempster’s words are as precise as his cuts. Huasteca is just one of many pre-Hispanic cultures that survive in Mexico. Dempster’s chronicle of the Huasteca is a moving achievement. I learned a lot, and realize I have a lot more to learn about Mexico. Clearly, a vital heritage is still being passed down in songs, recipes, folkways and art. You can see more sample images at Scribd, here. 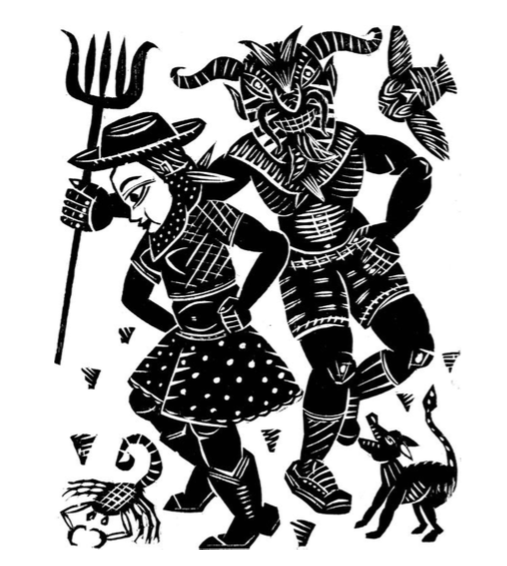 Lotería Hausteca is published in Erin, Ontario, Canada by Porcupine’s Quill. It can be ordered here through AbeBooks.com. NOTE: A Book Launch Party for Lotería Huesteca will be held in Toronto, Nov. 2 at the Gladstone Hotel. Starts at 7:30pm. Tickets $10 at the door, or free admission with purchase of the book! Live musical performance by Tlacuatzin direct from Veracruz. One and all succored at the The Tree of Life?